Britain has indicated it would support a UN-backed no-fly zone over Sudan's Darfur region to prevent aerial attacks on civilians, officials say. Meanwhile, the US has said it will have to consider other options if Sudan's government continues to block the deployment of a UN peacekeeping force. A US state department spokesman refused to give any details. Sudan says it is being unfairly targeted by the West. The UN Human Rights Council has agreed to send a team to investigate abuses. But the world's top human rights body has refrained from criticising Sudan's government over the violence. 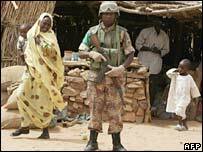 An estimated 200,000 people have died in Darfur since 2003, when rebels took up arms against the government. The violence has intensified despite the presence of some 7,000 African Union peacekeepers. A spokesman for British Prime Minister Tony Blair, said the UK would agree to a UN-sanctioned "plan B" to impose a no-fly zone in the region. The issue was raised at a meeting between President George W Bush and Mr Blair in Washington last week. US State Department spokesman Sean McCormack said: "We have to start thinking of other ideas on how to protect the people" from the violence in Darfur. Referring to the no-fly zone, he said "Prime Minister Blair talked about it as an idea," but Mr McCormack refused to give further details. The BBC State Department correspondent says other options could include a naval blockade or targeted air strikes against Sudan, but that these would need the backing of the UN Security Council. Our correspondent says until now some council members, such as China, have shown little enthusiasm for increasing pressure on Sudan over Darfur. Meanwhile, President Bush's special envoy to Darfur, Andrew Natsios, has just visited Khartoum for talks with Sudan President Omar al-Bashir. However, the BBC's correspondent says that, while Mr Natsios said the talks had been productive, there is still no sign that Sudan's government will agree to a UN force. There is a growing sense of frustration and urgency in Washington over the situation in Darfur, he says. Sudan has agreed to let the UN provide logistical support to a larger AU force, but refuses to allow UN troops into Darfur. The human rights council cannot force Sudan to accept UN peacekeeping troops. But human rights groups say a resolution sending the UN's top human rights experts to Darfur to investigate would have moral authority.